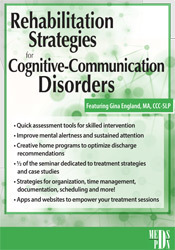 Gina England, MA, CCC-SLP, has been a clinical speech pathologist in New Hampshire for over 30 years. During this time, she has worked in a variety of clinical settings across the medical continuum of care including acute care, acute inpatient rehab, skilled nursing, outpatient therapy and neurological day treatment programs. Gina’s areas of interest and specialty have included cognitive rehabilitation, aphasia, motor speech, dysphagia and pediatric aquatic speech therapy. Since 2011, Gina has developed a private practice that focuses on the ongoing provision of direct clinical services and the participation in education and training workshops/ seminars across the United States. Gina has presented at numerous state associations’ annual conferences, including the New Hampshire and Vermont Brain Injury Associations and the New Hampshire Multiple Sclerosis Society. In addition to her role as a public speaker, she has also been a part time clinical faculty member in the Department of Communication Sciences and Disorders at the University of New Hampshire. She is also adjunct faculty at Granite State College and Nashua Community College, both of which are in New Hampshire.